There are some places in the world that have a reputation of being mysterious or even dangerous. The Bermuda Triangle comes to mind as an example. At Jamberoo we also have such a place. 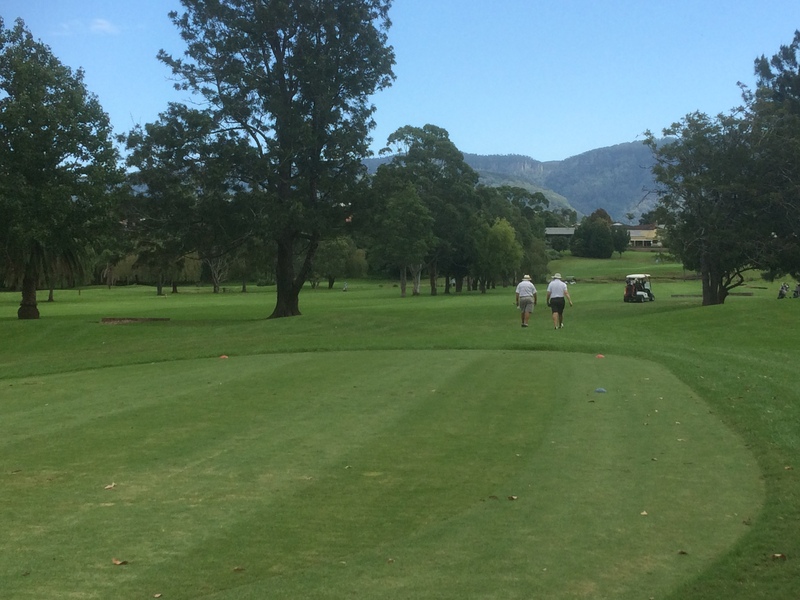 It is a place where good rounds of golf mysteriously disappear without a trace – the ‘Jamberoo Triangle’ – holes 16, 17 and 18. Today we investigate the 16th hole, an innocent looking, straight par 4 measuring 312 metres. 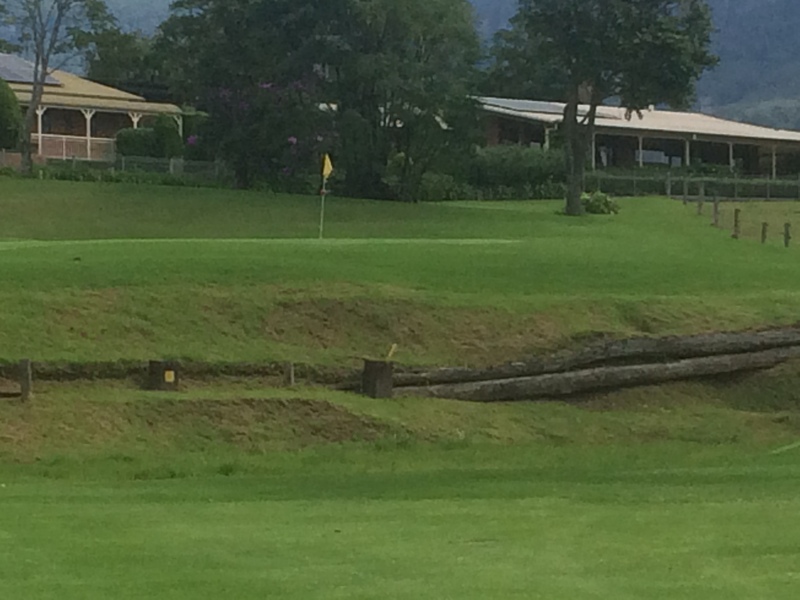 This hole is known as ‘The Farm’ due to its proximity to the adjoining property. Long hitters have to be careful using driver here as a water hazard before the green can grab that over-hit drive. Another water hazard runs the length of the hole to the right of the fairway and trees border the left making it important to hit it straight. Most plan to hit their tee shot to the middle of the fairway leaving a second shot measuring between 100-150 metres over the water to the raised green. Many people under club or mishit their shot into the water. Some go right where out of bounds waits nearby. Many go long to make sure they are over the water leaving themselves with a very difficult chip downhill to the green which slopes further away. Quite a few lay up short of the water believing caution as the greater part of valour. Take the wrong club and you are left with a very difficult 2 putt from either above or below the hole as the green is very sloped! Even short 1 metre putts require your full attention where you have to match pace and break to be successful. Walk away with a 4 (or nett 4) and you will be pleased. Much of the course equipment is kept at the Greens Compound. This includes sharp-edged mower blades, heavy machinery and hazardous chemicals. Although these are stored in safe places members are reminded for their own safety that the Greens Compound is for authorised personnel only. There have been reports that the course staff have had to take evasive action to avoid unauthorised people who have entered the compound without permission. Do not enter this area without permission from the head greenkeeper. Your Greens Committee met last week to continue to develop plans about improving the course and to seek information on the state of the putting surfaces. Martin Boatswain, the head greenkeeper, reports that he is pleased with the regrowth of the burnt areas of the greens, which have been reseeded, and expects that they will be fully recovered within the month. The practice putting green is almost back to standard. As part of this process of regrowing the bent grass, the greens have had to be watered more than usual. The greens that have been infested with couch have been scarified and treated with the best chemical on the market. They are slowly responding but it will be an ongoing work. Many of us at Jamberoo have gotten into the habit of signing our cards before we hit off. This is to avoid forgetting at the end of the round and being disqualified. Last Saturday for instance 6 members were disqualified as they or their marker forgot to sign the card. It seems sensible, right? Guess what, it is against the rules. Rule 6.6b states clearly that you must sign your card at the completion of the round or risk disqualification. There’s one to ponder. “After completion of the round, the competitor should check their score for each hole and settle any doubtful points with the Committee. They must ensure that the marker or markers have signed the score card, sign the score card themself and return it to the Committee as soon as possible. You have all noticed the earth works to the south western end of the carpark where the ramp has been removed. 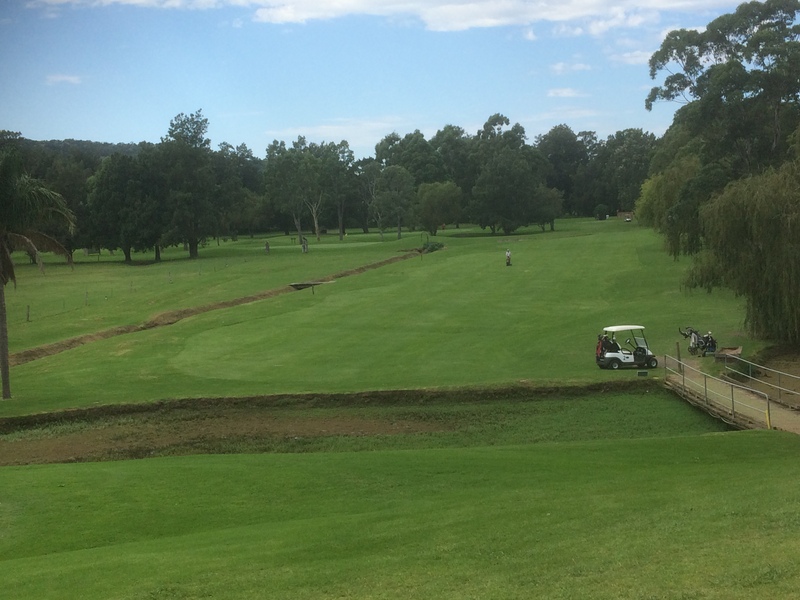 One of our own green staff, Shaun Langlands, has been working after hours to complete this work building a retaining wall. In its place a can and bottle recycling point will be built where you can exchange these recyclable items for shop vouchers or credit. This work is due to be ready in the next week. The club benefits by receiving a good rent for the space and we hope to take advantage of recycling opportunities as well. There will be more detail to this news in the coming week. With the playing of the Masters in America many members have been seen walking around bleary-eyed this week. On our own beautiful course they have been met with warm weather but with the course playing quite difficult. On Monday the Mens Veterans stableford was held with Jeff Draper taking out A division with 37 points and Geoff King taking out B division with 38 points on a countback from David Newton. 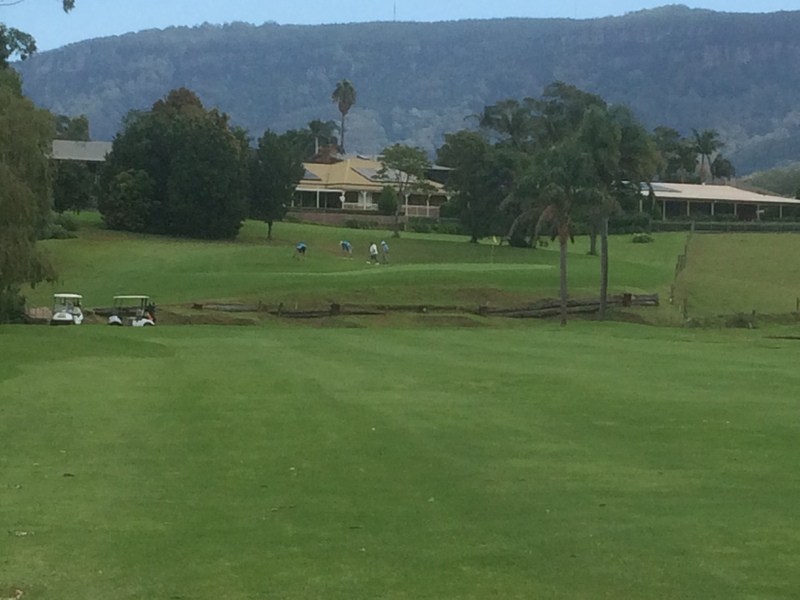 Tuesday saw the playing of the Jamberoo Ladies Open with our own Marilyn Wright being successful winning the Pat Dyball Trophy with a good score of 87. Shirley Walsh took out the Margaret Boyd Trophy best nett prize with 67 . The Elaine Honey Salver was won by A Schlodder with 27 pts. Elders Trophy (2 Person Aggregate Winners) were Jenelle Anderson and Shirley Walsh with 74 pts. 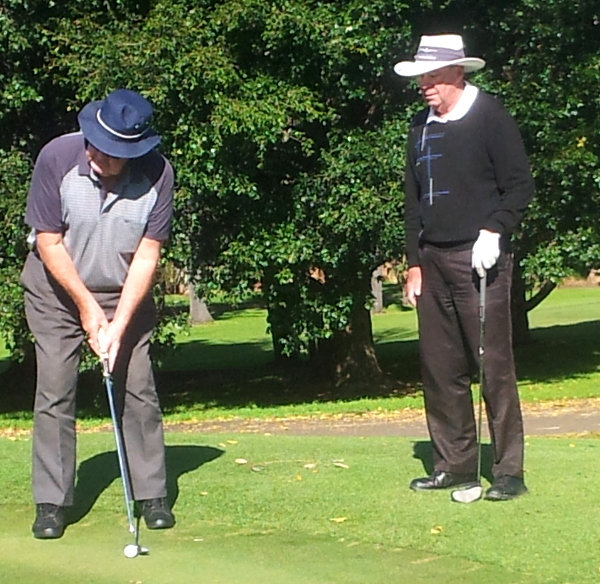 On Wednesday the Men played a Stableford event from the Blue course. A Grade winner was former club champion Martin Francis with 37 points, Toby Bartle was the B grade winner with 40 points beating Brian Bennett on a countback. C Grade winner was William Perry with 38 points While Lindsay Wiseman took out D grade with 35 points. On Saturday Scott Hainsworth fired a day’s best 40 points to win A Grade by 2 from Arthur Bosanquet, Michael Burton beat Daryl Campbell in B Grade on a countback with 38 points while early morning player Warwick Drew held on all day to win C/D Grade with 38 points. Kiama’s Kelly Greaves won the ladies with 32 points. I’ve seen Scott Hainsworth drink and I wouldn’t be surprised if he could get to 40 pints. You seem to be living one month behind the rest of us, skipper! Must have slipped into a time warp there! Back to the future now. the 16th 17th & 18th is not a triangle. I agree that it physically isn’t a triangle, but in a transcendent, philosophic way the three holes form a harmonious triumvirate with some mystical power over the result of a round of golf. Do Do Do Do. Do Do Do Do. We’re have I here’d that before.? Please look at the Championship results, much evidence to support my assertions. G’Day I left a comment about the dress code & where it left the starters in a quandary, obviously no one has any thoughts on the subject? Also I spoke about the shambles of the VETS hitting off at the same time the green staff are signing on, I suggested the VETS give the staff half an hour start. Nobody had any thoughts on that either, & my comments appear to have been deleted! thank you very much. Nobody has deleted anything. This is an open forum where all opinions are welcome. The problem with your posts are that they are in with years old posts. If you want people other than me to read them then always respond to the latest post (like you have here). I asked you to do this and you didn’t respond to my request. I also responded to your triangle argument. Did you read that? There is a section on this page called ‘recent posts’, did you see your posts there? I spend many hours each week writing articles and keeping members up to date with current happenings around the course. It is nice to hear from at least one member who reads the ‘daily cow’. If you are in need of help in accessing your posts then feel free to introduce yourself to me and I will show you on one of the computers at the course. As I am retiring from the Board this year, perhaps you can take over the writing of the newsletter? You have me confused with Brian Goodhew who wrote concerning the triangle, As for myself I did think I had been deleted, so I apologise for my mistake. I also wrote about the shambles of the VETS teeing off at the same time as the green staff sign on. There needs to be a reasonable gap between the two. I stand corrected there, sorry. As for your main concern, yes there should be a gap to let the greens staff get in front of the field. I’ll pass your info onto the Vets co-ordinator to deal with the matter. Lew can you tell me please if the greenstaff cut the greens before the vets comps? Yes they cut the greens the tees the fairways, in this order, that is why there needs to be a gap, they also rake the bunkers while all the time the VETS are right on their heels. Remembering that this after a weekend! If the groundstaff have to mow every day they should do it in the order of the course/1 2 3etc.but they tend to start on the 4th and then zig zag all over so they are always in your face.Once they had cleared the 1st they would be ahead and out of the way of the first groups out. No group should go out before the starter sends them out. As for the operational procedures of the staff I will have to ask about that at the next Greens Committee meeting in May. Thanks for your input. when the groups go out is already on the starters sheet.This is the problem Lew Fuller was making.The groundstaff seem to do their own thing without any sensible direction.Why mow the tees every day. I will ask the greenkeeper at my next meeting with him.